With a helium escape valve and high-precision Co-Axial movement, the Omega Seamaster Diver 300M is water resistant to 300 m (30 bar, 984 ft) and the first choice of both professional and recreational divers. Collectors also enjoy the limited editions. The Omega Seamaster Diver 300M originally premiered in 1993 as a chronograph. A three-hand version followed relatively soon thereafter. Just like its famous sister, the Seamaster 300, the Diver 300M is also water resistant to 300 m (30 bar, 984 ft). However, a helium escape valve at 10 o'clock helps to set the Diver 300M apart. This feature is especially important for saturation diving, where divers breathe a mix of oxygen and helium. Helium can enter the watch and cause damage during the decompression process if it's not released. Another distinctive detail is the date display included on every Diver 300M. Its design is also much more modern. The bezel's wavy edge, in particular, gives this timepiece a special appearance. Omega offers this watch in sizes ranging from 28 to 42 mm. Most models are made of stainless steel, though some limited editions also come in titanium or extremely rare tantalum. In the beginning, this professional diving watch was available with a quartz or automatic movement. Omega only uses mechanical movements for the current collection. These movements are not only chronometer-certified but also have been outfitted with Omega's Co-Axial escapement since 2006. At Baselworld 2018, the Biel-based manufacturer announced a new edition that will include their in-house Master Chronometer caliber, which can resist magnetic fields of up to 15,000 Gauss. 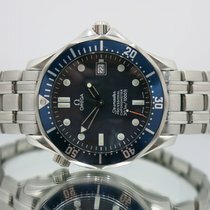 How much does an Omega Diver 300M cost? The Diver 300M is one of the youngest collections in the Omega catalog. Even so, this series offers an astounding variety of timepieces. For example, the three-hand variant comes in three sizes: 28, 36, and 41 mm. This makes it a great choice for both men and women. Omega has equipped the two larger versions with chronometer-certified automatic movements with Co-Axial escapements. On the other hand, the smaller edition is quartz-powered and lacks a helium escape valve. Prices for the larger models sit around 3,000 USD, while the smaller one costs as little as 1,700 USD. Examples from the 90s and early 2000s are interesting in terms of price. They are easy to recognize by the wave pattern on their dials. You can purchase the 41-mm quartz model for about 2,000 USD and the 36-mm watch with a chronometer-certified automatic movement from 1993 for just under 1,200 USD. However, any search for a Co-Axial escapement in these models will be in vain. 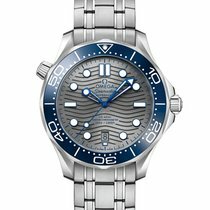 At Baselworld 2018, Omega announced the next generation of the Diver 300M to be released in the following late summer. The case now measures 42 mm in diameter and is available as a gold and steel bi-color model in addition to the stainless steel edition. Other changes include the date display's move from 3 to 6 o'clock, an even more reliable helium escape valve, and a tapered crown. What's more, the dial once again features the same wave pattern found on the original Diver 300M. The most important change, however, is the addition of a Master Chronometer caliber, which can withstand magnetic fields of up to 15,000 Gauss. Depending on the material, expect to pay between 5,100 and 10,400 USD for this redesigned diving watch. The Seamaster 300M with stopwatch function has a wide range to choose from as well. On the one hand, you can choose between a 41 or 44 mm case. On the other, there is also the option to purchase a model with an additional GMT function. This function uses an arrow-shaped central hand and a 24-hour scale to indicate the time in a second time zone. Plan to spend about 4,900 USD for this model. The standard chronograph version sells for around 4,100 USD. Just like the three-hand models, you can also save some money by purchasing an older chronograph. You can identify these watches by the layout of their subdials at 6, 9, and 12 o'clock with a date display at 3. The current models feature subdials at 3, 6, and 9 o'clock with the date display integrated into the hour counter at 6. You can call a titanium and gold bicolor model from the mid-1990s your own for around 2,900 USD. A well-maintained stainless steel edition from the early 2000s will run you about 3,800 USD. The Diver 300M made its debut on the silver screen in 1995 as James Bond's watch in the movie "GoldenEye." 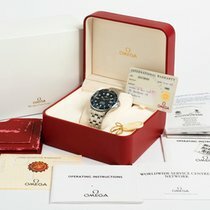 Since then, Omega has produced several limited editions in honor of Her Majesty's secret agent, 007. The most recent example is the so-called "Commander's Watch." With a limited run of 7,007 pieces, this Diver 300M sets itself apart from its sister models through its radiant white dial, a bezel with a red and blue ceramic inlay, and a red second hand sporting the 007 logo. What's more, the rotor is made to resemble the casing of a 9-mm bullet and is also adorned with the secret agent's logo. All this is visible thanks to a sapphire glass case back. This timepiece is worn using a NATO strap in blue, red, and gray – the colors of the Royal Navy. Be sure to set aside around 4,800 USD for this stainless steel timepiece. Omega also offers a version of the Commander's Watch in 18-karat yellow gold, which comes with an 18-karat gold bracelet in addition to the NATO strap. Only 7 (or 007) copies of this gold timepiece were ever made, making them a proper collector's item. You'll need a solid 30,300 USD to purchase this exclusive watch. However, there are also more affordable models, such as the Diver 300M Casino Royale. Its dial features the famous spiral gun barrel seen in the title sequence of every James Bond movie. This timepiece costs about 4,000 USD in good condition. 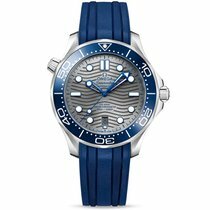 Plan to spend about 600 USD more for the Diver 300M James Bond 50th Anniversary edition, which was released in celebration of the 50th anniversary of the Bond series. The dial is decorated with many small '007' logos, and the '50' on the black ceramic bezel stands out in bright red. 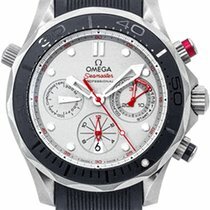 Omega also has a long history with the professional sailing crew Emirates Team New Zealand . The ETNZ timepiece is 44 mm in diameter and comes with a satin-brushed titanium case, a titanium dial, and a diving bezel with a black ceramic inlay. Furthermore, the minute counter at 3 o'clock is also outfitted with a 5-minute regatta timer. A red and black rubber strap keeps this watch safely on the wearer's wrist. In terms of price, expect to pay around 5,400 USD.